Spain conjures images of flamenco dancers, café-lined plazas, white hillside villages, and soaring cathedrals. This modern country offers top-notch art museums, inventive cuisine, and exciting nightlife. From the Pyrenees to the coast, its landscapes and varied cultures are worth exploring. Especially enticing is the national insistence on enjoying everyday pleasures. The Spanish live life to its fullest whether they are strolling in the park, pausing for a siesta, lingering over lunch, or dancing until dawn. We offer a wide variety of 3, 4 & 5-star hotels throughout Spain. From regal Madrid with its parks and palaces to Barcelona, Seville, Valencia, Bilbao, Palma de Mallorca and most points along the way. Let us help you choose the right accommodations and the perfect itinerary. Add a car rental, rail ticket, arrival/departure transfers, tours. 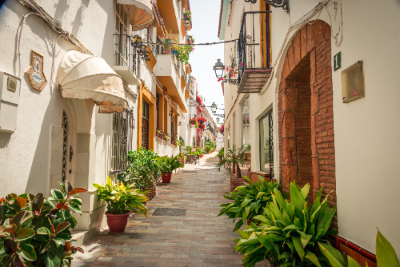 Explore the royal and historic highlights of Spain with a journey through Madrid and Costa del Sol. You will witness spectacular architecture from Spain’s grand past, museum cities, palaces and stunning landscapes, which Spain is well known for. From the Royal Palace in Madrid to the sun soaked coastlines of Marbella, you will come to understand the wonder that is Spain. Upon arrival in Madrid, you will be transferred to your hotel. The remainder of the day is at your leisure in this magical city.